Additional tickets are on sale for the Flyers exhibition, for Phantoms Season Ticket Holders, now through Wednesday at 11:59PM. Tickets go on sale to the general public Thursday morning (7/30) at 10. The game will be played at the PPL Center versus the New York Islanders (split squad) on Monday, September 21 at 7:05PM. If you have friends or relatives who want to come to the game, now is the time to grab up the tickets. As far as I could tell just typing in selections, good seats are still available. Use the link and the code in the email you should have received today. If you did not get it, call your ticket rep for more information. My speculation is that the Flyers game will sell out, but not until much closer to the date of the game. Upper corners and GA will probably remain until within a week or so of the game. Then again, I’m only guessing and could be wrong. Grab seats if you need them. Some new parking policies may be fully in effect by the time the hockey season starts. I’ll research and get the parking post updated as we get closer–as well as provide hockey-specific info for Phantoms Phans. Stay tuned. I’m thinking of starting a project where I rate and rank all of the downtown restaurants and eating establishments for pre-game on hockey nights. It’s a big project, but anything that has to do with food and drink is a labor of love, right? Anyone want in on the project? If you want to help me, sign up in the comments below. It’s still going to be a little while until the Phantoms/AHL schedule is available. I know, it’s horrible. However, the NBA needs to secure their arenas first, and they still have “mid-August” as their release date. Figure on a week or even a little more until we get the AHL schedule. I’ve marked my calendar (in pencil) for August 21–but I’m not holding my breath. I’m waiting for the one where I get paid $10,000.00 to jump around and throw sweaty T-Shirts and be a “super fan.” No? Not gonna do that this year? Good. September “General Meeting” of the Phan Nation Phan Club is scheduled for Wednesday September 23, 7PM at Chickie’s and Pete’s. Check their web site (www.phannation.org) for more details and updates. 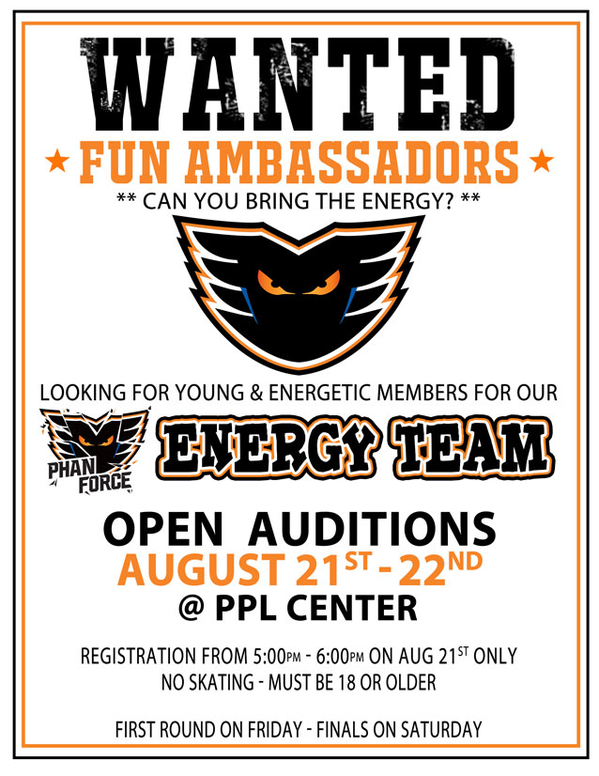 Keep your eyes out–I think the Flyers/Phantoms will sign a couple more “AHL” contracts before the summer is over. That’s all I’ve got for now. Stay tuned for a massive “Suggestion Box” post, coming soon. You know your well-grounded sense of sporting ethics and values would never allow you to become a professional view obstructionist. Don’t do it. It’s just not worth it. Long before you are hauled off to The Hague and formally charged with Crimes Against Hockey, you would experience an acute sense of shame and guilt that you, as most people, would probably find a little too overwhelming.